Evolution works slowly and randomly, changing little bits here and there until an entirely new thing emerges eons later. Sometimes, these changes are insignificant or boring, yet other times, the mutations are so ridiculously weird that they’re destined for the prehistoric hall of fame. When you see how much certain creatures have changed over time, it makes you wonder how today’s animals will adapt for the future. Will the creatures of today look as strange to future generations as prehistoric animals look to us? 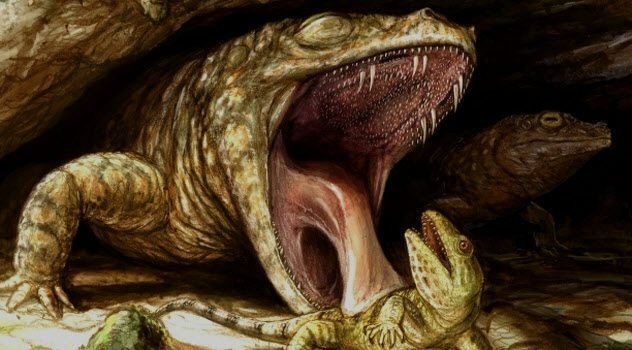 Modern amphibians are mostly toothless, but their ancient ancestors 300 million years ago boasted some of the most horrifying mouths ever designed by nature. Most vertebrate teeth are neatly arranged across the bones of the hard palate. But prehistoric amphibians had bony plates on their soft palate as well, lining the entire roof of the mouth with thousands of denticles (hooklike mini-teeth) in addition to sets of fearsome fangs. Amphibians used this gruesome dental combination to snag prey and keep them in place as the amphibian drew its eyes down into its mouth to help force the struggling prey down its slimy gullet. 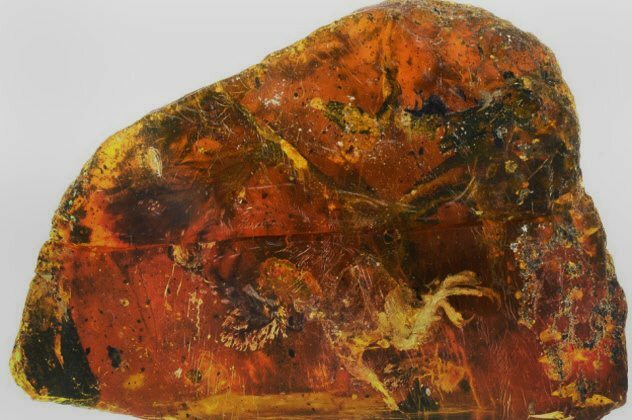 A 99-million-year-old baby bird locked inside a glob of Burmese amber is the best-preserved specimen of its kind. The toothed bird, an avian dinosaur, lived alongside the other dinosaurs and died with them, too, when the entire Enantiornithes group perished 65 million years ago at the closing of the Cretaceous period. As a result, it is believed that there are no living descendants of the Enantiornithes. The bird was only days old when it was unluckily engulfed in a wad of tree resin. Luckily for scientists, enough of it remained to allow an amazingly accurate, full 3-D model to be made via CT scan. The feathers on its wings appear flight-worthy, while its body plumage resembles theropod feathers. So this avian dinosaur might have sprung from the egg fully fledged and ready to take to the skies unlike the helpless baby birds of today. 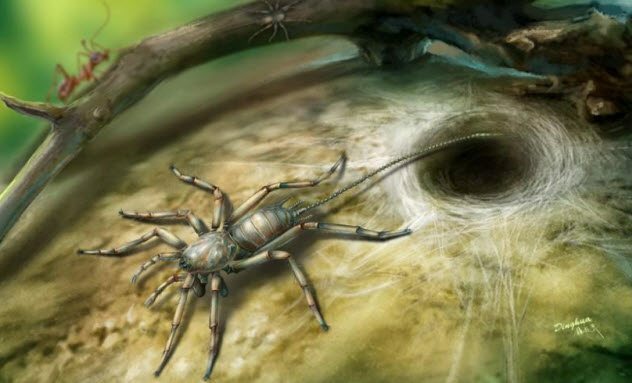 All sorts of ghastly creepy-crawlies scuttled around the dinosaurs’ feet, including a tailed spiderlike creature that roamed tropical forests 100 million years ago. Less than 2.5 centimeters (1 in) in length, Chimerarachne yingi is the “missing link” in the arachnid family because it has a combination of body parts that bridges the gap between proto-spiders and bona fide spider-spiders. Most obvious is the unsettling tail, half of its body length, which was covered in short hairs and probably used as a sensory organ to detect other critters. But it also had silk-producing spinnerets, absent in spider forerunners, which it may have used to line its burrow or wrap its eggs. 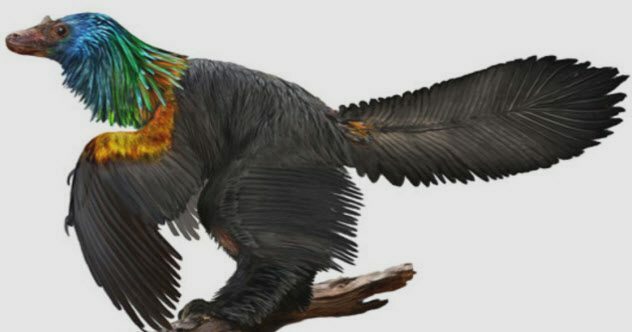 Researchers have discovered the most fabulous dinosaur, dubbed Caihong juji (Mandarin for “rainbow with the big crest”) because of its, well, big rainbow crest. The birdlike dinosaur’s velociraptor-shaped head and neck are covered in a multicolored ruffle, which would have been all the more noticeable in a pre-flowering Jurassic. But while its ostentation may have made it a more obvious target, it needed that brilliant flounce to woo potential lovers, much like a peacock. The 161-million-year-old specimen is not only the earliest creature with hummingbird-like iridescence but also the first with asymmetric feathers on its wing tips, a feature that gives modern birds superior aerial control. 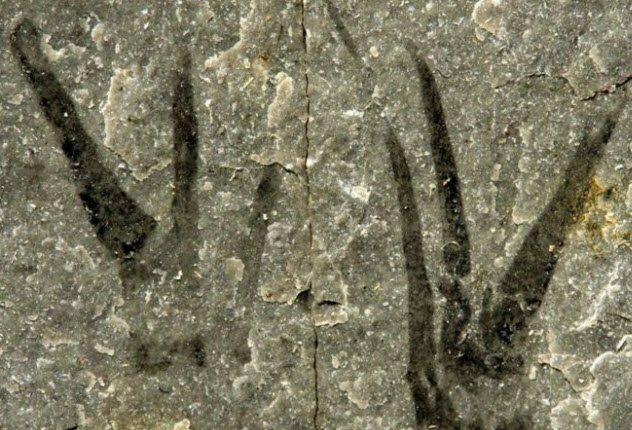 The scissorlike hands of Kooteninchela deppi earned it the distinction of being the first prehistoric creature named after Johnny Depp’s portrayal of Edward Scissorhands. 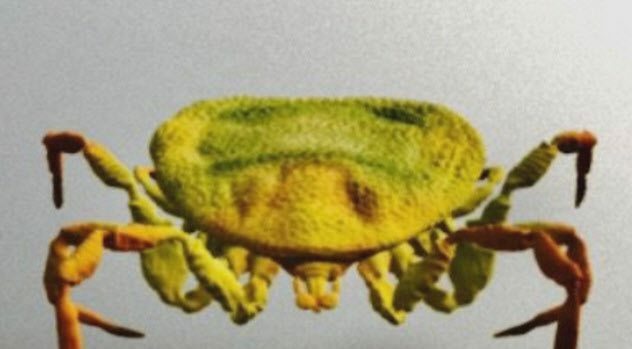 The 505-million-year-old fossil reveals what looks like a hybridized lobster and millipede with stalked, multi-lensed eyes, though it came way before the lobsters or scorpions to which it is related. It lived in shallow coastal ranges in what was then much warmer waters. It could swim, when necessary, but preferred to use its many sets of stubby, millipede-like legs to peruse the seafloor, scavenging bits or snatching at unsuspecting prey with its otherworldly scissor hands. Coxoplectoptera is so unlike any other insect in evolutionary history that its name constitutes a brand-new taxonomic order. Coxoplectoptera lived during the Lower Cretaceous (146 million to 100 million years ago) and is a long-gone relative of mayflies. Of course, that’s only academic because it looks nothing like a mayfly or anything else known to science. Its wings are veined like a mayfly but, along with its breast, shaped like those of a dragonfly. And creepiest of all, it sports the legs of a praying mantis. Just like a mantis, it ambushed its prey, probably while hiding itself in river mud. Penguins have grown fun-sized over the past millions of years, and their tallest representative, the emperor, stands only 122 centimeters (4’0″) tall. But researchers recently discovered a 55- to 60-million-year-old variant, Kumimanu biceae, that matched the size of a portly human adult. Kumimanu biceae towered 170 centimeters (5’7″) into the sky and weighed a hefty 100 kilograms (220 lb). That’s already twice as tall as the penguins that came just a few million years earlier. 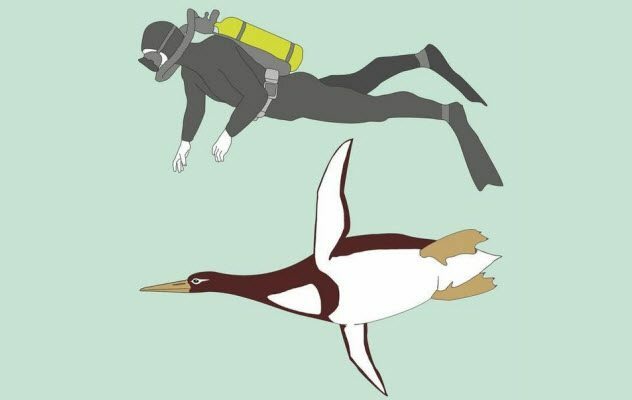 It appears that the penguin race quickly ballooned in size after differentiating from flying birds and ditching the skies for the seas—an event that likely occurred circa the extinction of the dinosaurs 66 million years ago. Although tick history is fragmented at best, it was bolstered by a recently discovered batch of bloodsucking parasites immortalized in nearly 100-million-year-old amber. Deinocroton draculi (translated from Latin as “Dracula’s terrible tick”) has no eyes and loves blood. One specimen met its end right after dining and was found engorged eight times past its standard size. Equally fortuitous, the amber also preserved a bit of dinosaur feather from its dinner. The exact type of dinosaur feather is unknown. But it does not resemble that of more modern flying birds which supports the idea that these ticks terrorized (or at least annoyed) the mighty dinosaurs themselves. 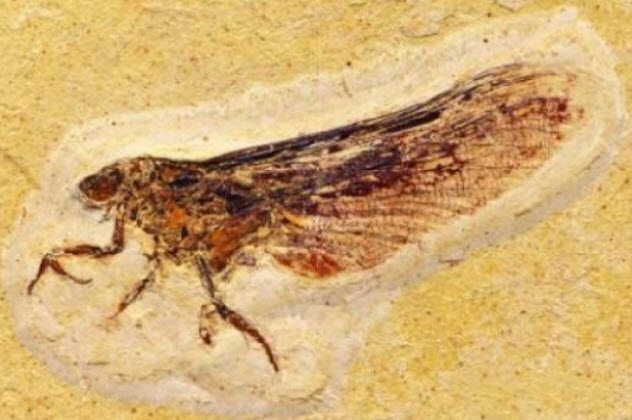 An almost perfectly preserved Borealopelta markmitchelli specimen is being hailed as one of the most awe-inspiring fossils ever recovered. 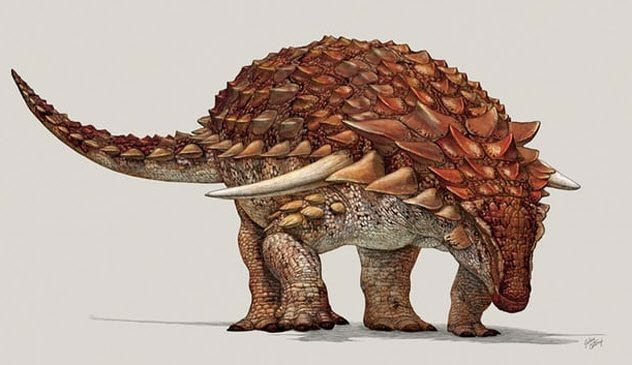 The 110-million-year-old beast was a walking tank, with a 1.5 ton, nearly 6-meter-long (20 ft) frame that was armored to the teeth, covered in horns like a giant pineapple, and equipped with 51-centimeter-long (20 in) shoulder spikes. Since its body was enveloped in sediment soon after it sank to the ocean floor, a touch of red melanin pigment survived the process. The resultant ginger hue contrasted from dark to light on the dinosaur’s back and belly to give the lumbering (but often preyed upon) brute the added protection of camouflage. 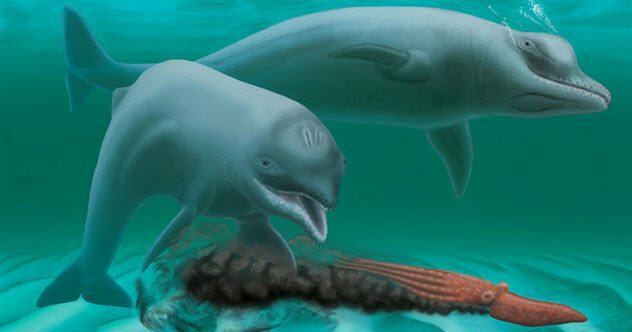 Inermorostrum xenops, a newly discovered species of extinct dolphin, provides a unique example of early cetacean evolution in feeding habits. It is the earliest suction feeder yet discovered. The 1.2-meter-long (4 ft) dwarf scoured the seas 30 million years ago. Not only smaller than its modern counterparts but also much goofier, this dolphin sported a stubbier, toothless snout with enlarged lips and possibly whiskers. Like its descendants, it was equipped with echolocation. But without the benefit of teeth, this dwarf dolphin sucked up its food like a vacuum cleaner. Like a walrus, Inermorostrum xenops floated about the seafloor Hoovering up fish and squid. Read about more bizarre animal adaptations on 10 Rare Animals With Bizarre Adaptations and 10 Totally Weird Creature Adaptations.